^ 1.0 1.1 Balaenoptera physalus. IUCN Red List of Threatened Species 2008. International Union for Conservation of Nature. 2009. ^ Synopsis Mammalium. 1829: 525. ^ Bulletins de l'Académie Royale des Sciences, des Lettres et des Beaux-Arts ... - Académie Royale des Sciences, des Lettres et des Beaux-Arts de Belgique (Bruxelles) - Google ubNX. 1859: 403. ^ 8.0 8.1 8.2 8.3 8.4 8.5 8.6 長鬚鯨（Balaenoptera physalus）. MarineBio.org. [2006年10月23日]. （原始内容存档于2007年10月17日）. ^ 9.0 9.1 9.2 9.3 9.4 9.5 9.6 9.7 9.8 國家海洋漁業局（National Marine Fisheries Service）. Draft recovery plan for the fin whale （Balaenoptera physalus） (pdf). 馬里蘭州蒙哥馬利縣銀泉: 國家海洋漁業局. 2006年. ^ Revised Management Scheme. 國際捕鯨委員會. [2006年11月7日]. （原始内容存档于2006年9月28日）. ^ Agnarsson, I.; May-Collado, LJ. The phylogeny of Cetartiodactyla: the importance of dense taxon sampling, missing data, and the remarkable promise of cytochrome b to provide reliable species-level phylogenies. Mol Phylogenet Evol. 2008, 48 (3): 964–985. PMID 18590827. doi:10.1016/j.ympev.2008.05.046. ^ Price, SA. ; Bininda-Emonds, OR. ; Gittleman, JL. A complete phylogeny of the whales, dolphins and even-toed hoofed mammals – Cetartiodactyla. Biol Rev Camb Philos Soc. 2005, 80 (3): 445–473. PMID 16094808. doi:10.1017/s1464793105006743. ^ Montgelard, C.; Catzeflis, FM. ; Douzery, E. Phylogenetic relationships of artiodactyls and cetaceans as deduced from the comparison of cytochrome b and 12S RNA mitochondrial sequences. Molecular Biology and Evolution. 1997, 14 (5): 550–559. PMID 9159933. doi:10.1093/oxfordjournals.molbev.a025792. ^ Spaulding, M.; O'Leary, MA. ; Gatesy, J. Relationships of Cetacea -Artiodactyla- Among Mammals: Increased Taxon Sampling Alters Interpretations of Key Fossils and Character Evolution. PLoS ONE. 2009, 4 (9): e7062. Bibcode:2009PLoSO...4.7062S. PMC 2740860. PMID 19774069. doi:10.1371/journal.pone.0007062. ^ "The Society for Marine Mammalogy's Taxonomy Committee List of Species and subspecies" 互联网档案馆的存檔，存档日期2015-01-06..
^ Gingerich, P. Whale Evolution. McGraw-Hill Yearbook of Science & Technology. 麥格勞-希爾公司（The McGraw Hill Companies）. 2004年. ISBN 0071427848. ^ 21.0 21.1 馬丁, 安東尼·R·. 鯨與豚. 倫敦: Salamander Books. 1991年. ^ 22.0 22.1 22.2 22.3 22.4 22.5 22.6 22.7 22.8 22.9 Fox, David. 長鬚鯨（Balaenoptera physalus）. 動物多樣性網站（Animal Diversity Web）. 2001年 [2006年10月22日]. ^ 25.0 25.1 25.2 Lin, Brian. Whale Has Super-sized Big Gulp. University of British Columbia. 2007-06-07 [2007-06-08]. ^ 27.0 27.1 Payne, Roger. Among Whales. 紐約: Scribner. 1995年: 176. ISBN 978-0-684-80210-7. ^ Finback Whales. Bioacoustics Research Program, Cornell Lab of Ornithology. [2006-10-26]. （原始内容存档于2007-07-14）. ^ W. J. Richardson, C. R. Greene, C. I. Malme and D. H. Thomson, Marine Mammals and Noise (Academic Press, San Diego, 1995). ^ Segelken, R. Humanity's din in the oceans could be blocking whales' courtship songs and population recovery. Cornell University. 2002-06-19 [2006-11-11]. ^ Mead, J.G. Records of Sei and Bryde's whales from the Atlantic Coast of the United States, the Gulf of Mexico, and the Caribbean. Rep. int. Whal. Commn. 1977,. Spec. Iss. 1: 113–116. ISBN 978-0-906975-03-9. ^ 34.0 34.1 Mitchell, E. Present status of Northwest Atlantic fin and other whale stocks. (编) W.E. Schevill (ed.). The Whale Problem: A Status Report. Cambridge, MA: Harvard University Press. 1974: 108–169. ISBN 978-0-674-95075-7. ^ 35.0 35.1 Rice, D.W. Whales and whale research in the eastern North Pacific. (编) W.E. Schevill (ed.). The Whale Problem: A Status Report. Cambridge, MA: Harvard University Press. 1974: 170–195. ISBN 978-0-674-95075-7. ^ 39.0 39.1 Clark, C.W. Application of US Navy underwater hydrophone arrays for scientific research on whales. Rep. Int. Whal. Commn. 1995, 45: 210–212. ^ Sigurjónsson, J. On the life history and autecology of North Atlantic rorquals. (编) A.S. Blix, L. Walløe, and Ø. Ulltang (ed.). Whales, Seals, Fish and Man. Elsevier Science. 1995: 425–441. ISBN 978-0-444-82070-9. ^ D.E. Sergeant. Stocks of fin whales Balaenoptera physalus L. in the North Atlantic Ocean. Rep. Int. Whal. Commn. 1977, 27: 460–473. ^ Allen, K.R. A note on baleen whale stocks of the north west Atlantic. Rep. Int. Whal. Commn. 1970, 20: 112–113. ^ Breiwick, J.M. Population dymanics and analyses of the fisheries for fin whales (Balaenoptera physalus) in the northwest Atlantic Ocean. (Ph.D. thesis) University of Washington, Seattle. 310 pp. 1993. ^ Hay, K. Aerial line-transect estimates of abundance of humpback, fin, and long-finned pilot whales in the Newfoundland-Labrador area. Rep. Int. Whal. Commn. 1982, 31: 373–387. 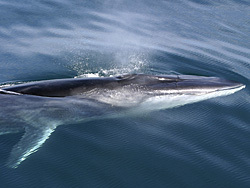 ^ Larson, F. Abundance of minke and fin whales off West Greenland. Rep. Int. Whal. Commn. 1995, 45: 365–370. ^ Jonsgard, A. On whale exploitation in the eastern part of the North Atlantic Ocean. (编) W.E. Schevill (ed.). The Whale Problem: A Status Report. Cambridge, MA: Harvard University Press. 1974: 97–107. ISBN 978-0-674-95075-7. ^ Roman, J. and Palumbi, S.R. Whales Before Whaling in the North Atlantic (PDF). Science. 2003, 301: 508–510. ^ Rice, D.W. Whales and whale research in the eastern North Pacific. (编) W.E. Schevill (ed.). The Whale Problem: A Status Report. Cambridge, MA: Harvard University Press. 1974: 170–195. ISBN 978-0-674-95075-7. ^ Chapman, D.G. Estimates of stocks (original, current, MSY level and MSY)(in thousands) as revised at Scientific Committee meeting 1975. Rep. Int. Whal. Commn. 1976, 26: 44–47. ^ Barlow, J. Preliminary estimates of the Abundance of Cetaceans along the U.S. West Coast: 1991–2001. Administrative report LJ-03-03, available from Southwest Fisheries Science Center, 8604 La Jolla Shores Dr., La Jolla CA 92037. 2003. ^ Caretta, J.V., K.A. Forney, M.M. Muto, J. Barlow, J. Baker, B. Hanson, and M.S. Lowry. U.S. Pacific Marine Mammal Stock Assessments: 2005 (PDF). U.S. Department of Commerce Technical Memorandum, NOAA-TM-NMFS-SWFSC-388. 2006. ^ IWC. Report of the sub-committee on protected species. Annex G, Appendix I. Rep. Int. Whal. Commn. 1979, 29: 84–86. ^ American Cetacean Society Fact Sheet: Fin Whale, Balaenoptera physalus. American Cetacean Society. [2006-10-23]. （原始内容存档于2006-09-27）. ^ IWC. Report of the scientific committee. Rep. Int. Whal. Commn. 1995, 45: 53–221. ^ Barlow, J., K. A. Forney, P.S. Hill, R.L. Brownell, Jr., J.V. Caretta, D.P. DeMaster, F. Julian, M.S. Lowry, T. Ragen, and R.R. Reeves. U.S. Pacific Marine Mammal Stock Assessments: 1996 (PDF). NOAA Technical Memo NMFD-SWFSC-248. 1997. ^ Yablokov, A.V. Validity of whaling data. Nature. 1994, 367: 108. ^ Species Profile for Finback whale. U.S. Fish & Wildlife Service. [2006-10-23]. （原始内容存档于2006-10-02）. ^ Iceland to Resume Whale Hunting, Defying Global Ban. Bloomberg.com. 2006-10-18 [2006-10-23]. ^ U.S. Protests Japan’s Announced Return to Whaling in Antarctic. Bureau of International Information Programs, U.S. Department of State. 2006-11-20 [2006-11-27]. （原始内容存档于2006-11-27）.